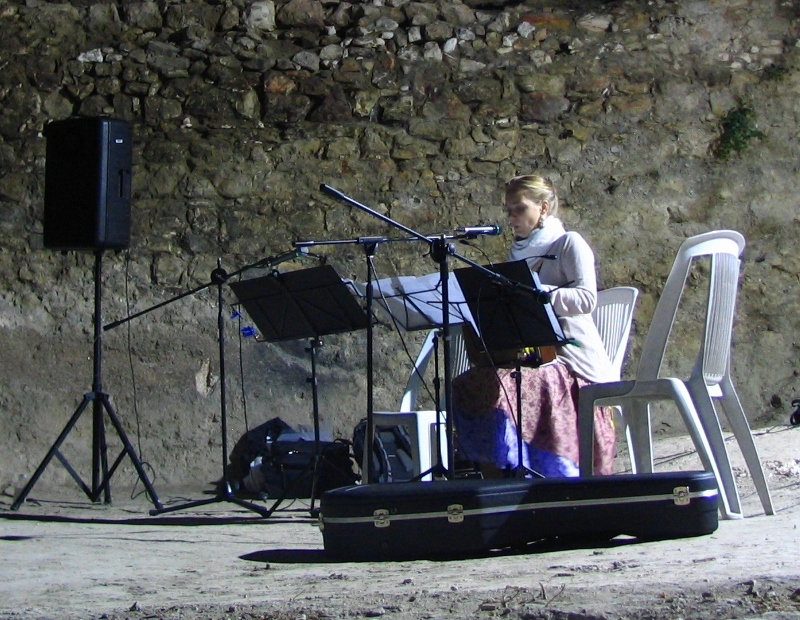 I am not much given to hyperbole and superlatives, but it occurs to me that a recent event conducted in the Old City represents an absolute first in Jerusalem history: a concert — or any other type of public gathering, for that matter — held in the historic Hezekiah’s Pool (aka “Patriarch’s Pool”). The official e-mail invitation was interesting: attendees could gather at Jaffa Gate and be escorted to the venue, OR (it beckoned with blithe innocence) “join us directly at the Patriarch’s Pool” — as if that were the most natural thing in the world! I phoned for more information, then went in daylight to scope out the place. This post serves very much as a follow-up to my previous offerings tracking the progress of the clean-up of this site starting in June 2011, HERE, HERE, and HERE. Reviewing my previous reporting, I was struck by the fact that the basic clean-up, during which a huge volume of debris was removed, took only about two months! Then last winter I was monitoring the renewed accumulation of rainwater and the seemingly futile efforts to manage it (see photo below). Throughout, I wondered what would become of the newly-cleared space, how it would be used — and by whom. Now, it seems some of those questions are being answered. The pool’s southeast corner, 04 OCT 2012. A curving plastic conduit is now embedded in the floor, for pumping water out from the squarish sump (right). The October 4th concert, which I made a point of attending, was put on by the Al-Quds University College of Music, as part of its Autumn Academy program. Al-Quds is Jerusalem’s only Arab university, with its main campus situated in Abu Dis (on the other side of the separation barrier — The Wall — from Jerusalem) but at least four other units or satellite centers scattered throughout the Old City and East Jerusalem. I arrived at the concert half an hour late — as it was just getting underway: Ah, the Middle East. All in all, it was a rather simple affair — a humble beginning — held in the pool’s southwestern corner: A bit of special lighting, a sound system, seating mostly on mats or blankets, the night sky, the vast expanse of the pool itself… and the music. 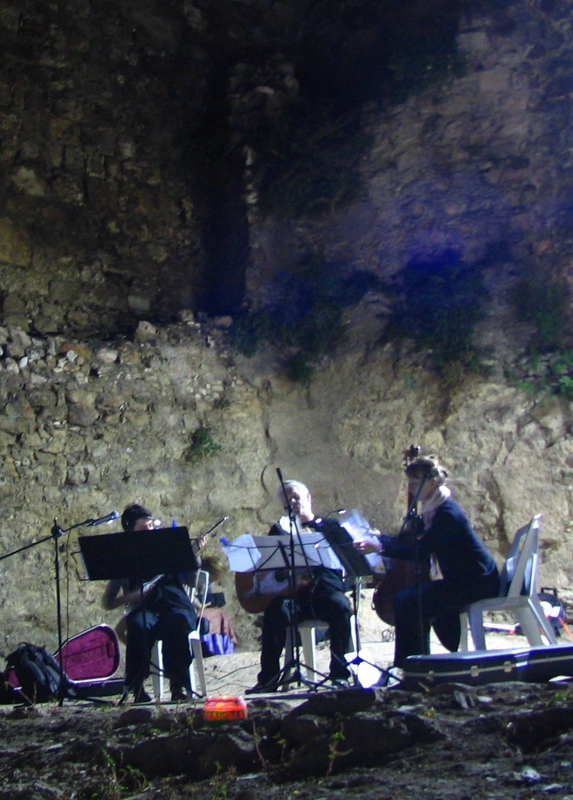 The performers, including both local and international artists, were all excellent: “Flautarre“, a flute and guitar trio from Germany; the Austrian mezzo-soprano Aglaia Maria Mika; and guitarist Mu’tasem Adileh, Associate Professor of Musicology at Al-Quds. Back when the pool clean-up plan was first announced in the press, part of the story was the conflicting claims of ownership of the place, among the Greek Orthodox church, the Coptic church and the Islamic Waqf (religious trust). 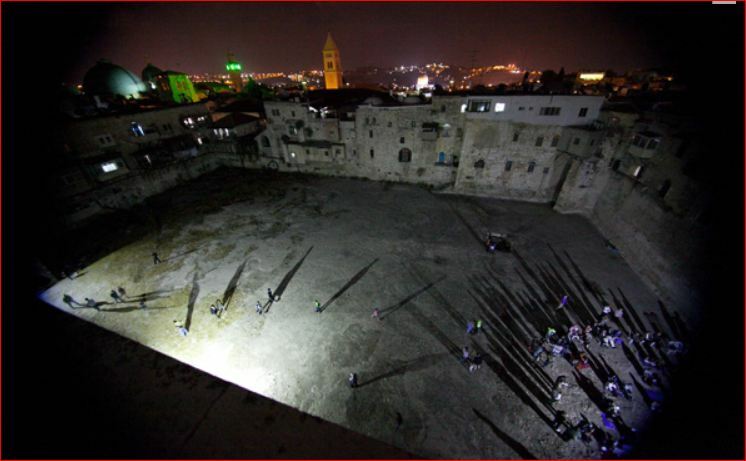 In the end, three public bodies, spearheaded by the Jerusalem Municipality, carried out the project. Now, one wonders how real the apparent confusion over ownership was. In any event, it appears the Waqf came out on top. The organizer of the concert for Al-Quds tells me that the university has in fact leased the pool itself from the Waqf, and has obtained access to the pool from the Coptic Orthodox Patriarchate. All this through a series of very “sensitive” negotiations, she says. Indeed. The actual entry into the pool, it turned out, is through the so-called Coptic Khan (a historic structure now used as a residential compound), via a vaulted medieval-looking hall, and then down a flight of steps near the pool’s northwestern corner (pictured below). By the way, the place is not open to the public, so no need to pop in for a look. Also, I can say that there are folks who would like to see some archaeological soundings or probes carried out in the pool, but on this we will have to wait and see. Staircase access near the pool’s NW corner. 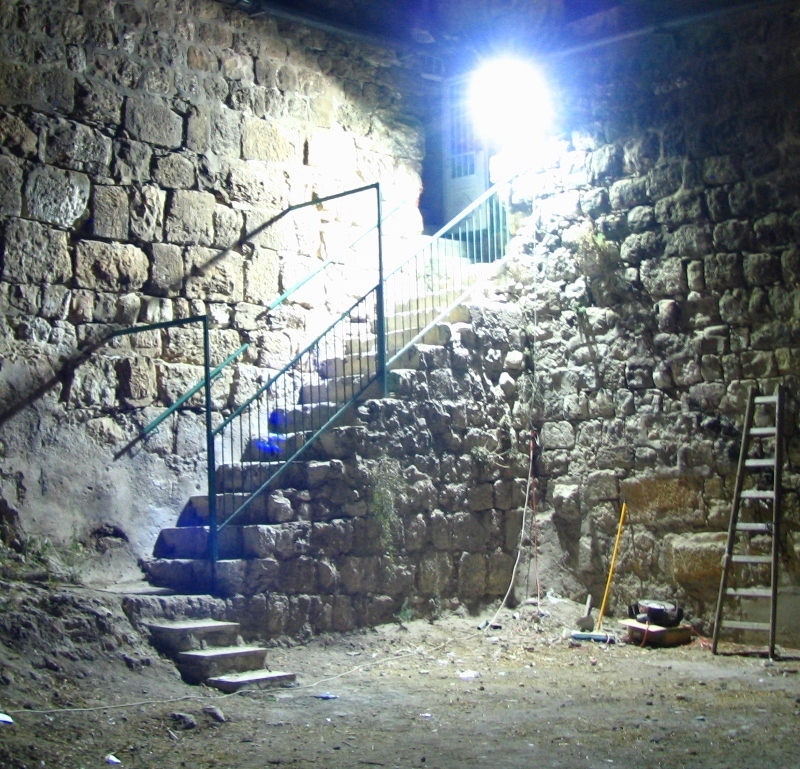 A staircase probably existed here long before the Crusader period. Newly-exposed northwest staircase (arrow), 07 JUL 2011. Note the depth of debris yet to be removed (right). A key point of the pool’s history, it seems, is that when the Crusaders lost Jerusalem in 1187, Saladin gave the pool the status of waqf, a protected religious property, which apparently remains in force right to the present day. I was intrigued by the “bath” connection and decided to dig a little deeper. For one thing, where was this bath? The map below (*Pringle, p. 197) shows the location, at the western edge of the Muristan, the large, bustling quarter of the Knights Hospitaller in the 12th century. On the map, the central room of the bath is shaded pink, but I suspect that several of the adjoining rooms to the south were part of the bathhouse complex as well. At far left, the very eastern edge of Hezekiah’s Pool is shaded blue. 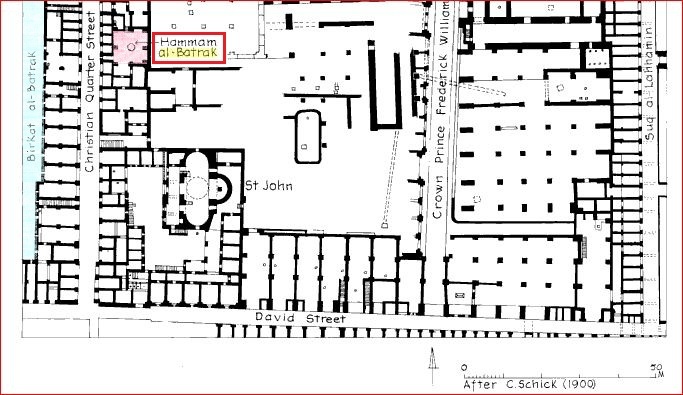 Reference points for making sense of the map: Christian Quarter Street (left), David Street (bottom), and the Church of St. John the Baptist; north is at the top. 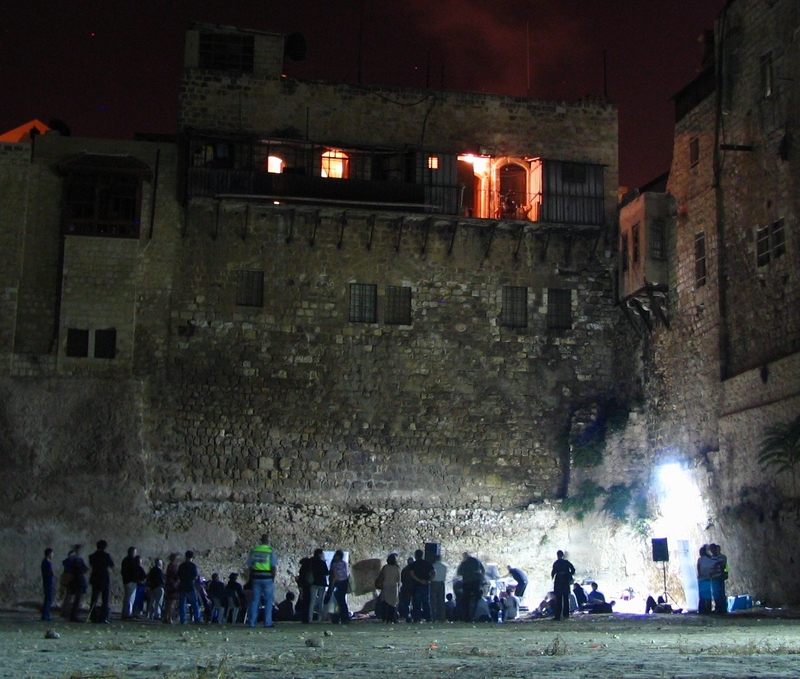 While the bathhouse was obviously patriarchal property, I cannot imagine that the patriarch used it personally, since his private residence, quite a large palace, lay some distance away, north of the Church of the Holy Sepulchre; the palace site was later occupied by a Sufi hospice which today is the El-Kahnqa Mosque. Anyway, I know if I were the patriarch I would have a bathhouse in my palace! But the name would have been important in any event, in terms of proclaiming ownership, since the bathhouse abutted the large compound of the Hospitallers (‘on the same team’, yes, but a separate entity). More to the point, perhaps: if the bathhouse was used by pilgrims, for a fee, then it would have been a source of income. What I find extremely interesting is that this bathhouse remained functioning at least until the end of the 19th century! 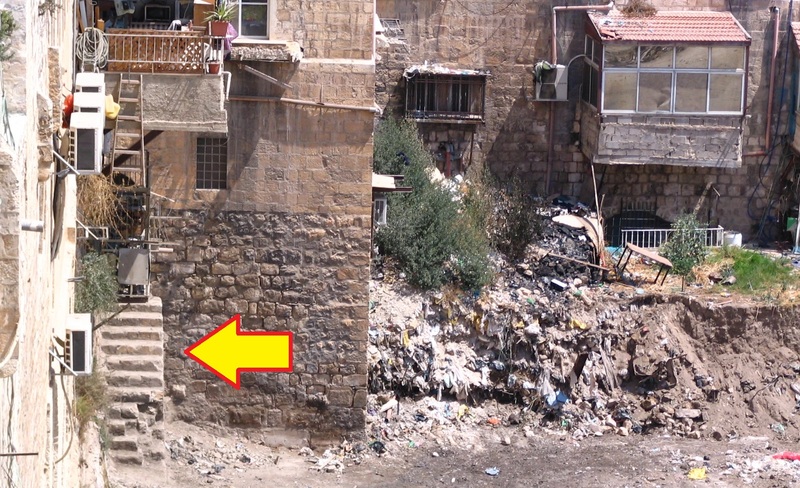 In what must have been one of the last things he ever wrote for the Palestine Exploration Fund Quarterly Statement (PEQ) — he died in December 1901 — Conrad Schick noted that the bathhouse had no cistern, but “water is drawn up by buckets from Hezekiah’s Pool and conveyed in a channel crossing Christian Street on an arch to the bath” (PEQ 1902, p. 51-52). By that time we can guess that the water accumulating in the pool was no longer suitable for drinking but deemed clean enough for bathing in. A slightly earlier writer, George Williams, noted in 1849 that the Patriarch’s Pool was at that time still being supplied with water by the aqueduct coming in from the Mamilla Pool (The Holy City: Historical, Topographical and Antiquarian Notices of Jerusalem, p. 18). *NOTE: Several bits of the above information I mined from the wonderful reference book Jerusalem in the Time of the Crusades, by Adrian Boas. Also helpful was Denys Pringle’s monumental compendium Churches of the Crusader Kingdom of Jerusalem, Vol. 3: The City of Jerusalem. 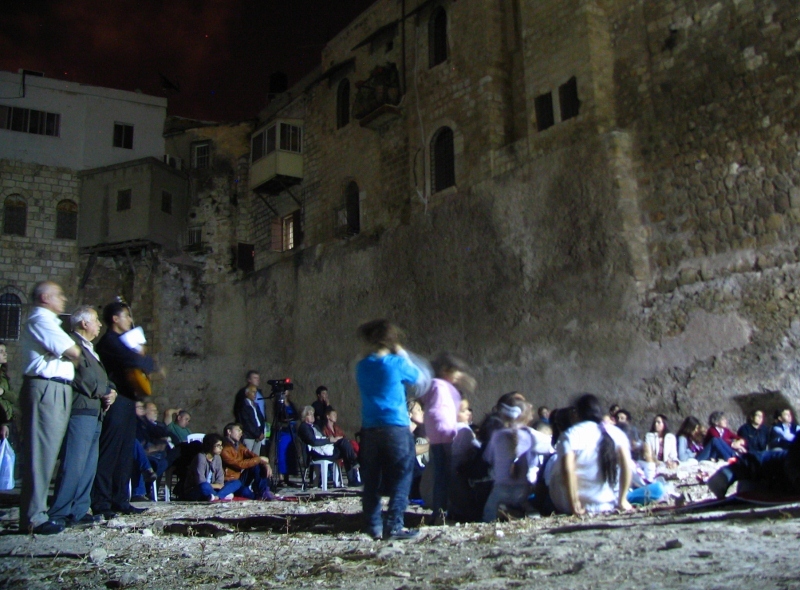 Part of the audience enjoying the October 4th concert. Here is another report on the concert and the pool clean-up project (in French), from Terrasanta.net. It includes a great rooftop view of the October 4th event (which I have reproduced below), part of a slide show of seven images. This entry was posted in Antiquities, Hezekiah's Pool, JERUSALEM, Jerusalem Antiquities, Jerusalem Places and tagged Al-Quds University, Coptic Khan, Hammam al-Batrak, Hezekiah's Pool, Jerusalem, music, Old City, Patriarch's Bath, Patriarch's Pool, Waqf. Bookmark the permalink. Tom – Very interesting. Thanks for posting this. I have photos of the pool taken from the top of the Petra Hotel. Is it possible to still go there for the view of the Old City? Jim, hello — Thanks for your comment. Yes as far as I know the roof of the Petra Hostel is open again (it was closed for a while in 2011 for repairs); I believe they charge a few shekels to go up there. It’s a great viewpoint indeed. Other rooftop viewpoints around town worth checking out: the Swedish Christian Study Center inside Jaffa Gate; the Austrian Hospice opposite Station III of the Via; and Paulus House outside Damascus Gate (be sure to also see their upgraded museum area downstairs, including the Conrad Schick models). I was beginning to worry since you hadn’t added a blog in a while. Glad to know you are still poking around in interesting places in Jerusalem! Joyce and I are leading another Taylor University tour to Israel on February 26. We are staying over after the tour leaves on March 7 at Tantur. We will stay about a month there for research and touring. Next year in Jerusalem! Larry, hi — Good to hear from you! 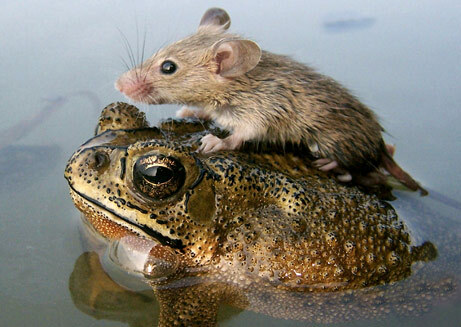 Yes, I just needed a break from the web-log for awhile to focus on some other things. I hope to continue with occasional posts, but maybe on a lesser schedule (it’s a lot of work! — at least the way I do it). Hope to see you when you’re here next year — Be sure to get in touch. FOLLOW-UP regarding the Patriarch’s Bath: The “future ramble” referred to in my post actually took place. Before relocating stateside in 2013, I worked out the probable location, based on Schick’s map (above), and discovered that the structure itself did not disappear as I had suspected. Remnants of the bath-house spaces have in fact been totally transformed into a large souvenir shop along the east side of Christian Quarter Road. There is a published photograph from the 1920s of the then-extant central dressing room, plus architectural plans for a proposed (but never realized) restoration of the place by the British Pro-Jerusalem Society. The present-day shop proprietor remembers his family totally renovating the spaces, in the 1970s as I recall.